All-natural, fast-acting and long-lasting relief from stress—without sedatives! 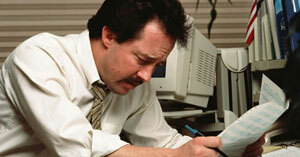 Stress is perhaps the #1 health issue affecting Americans today. Money worries…the pressure on the job…family concerns…and even the fearful news of the economy work together to wear you down. Research shows women are far more likely to suffer from higher-levels of stress than men. And stressed-out moms are passing this stress along to their children. 34% of children know their parent is stressed when they raise their voice. One-third are worried their parent is stressed. Stress not only affects your body, but also your mind. It impacts the way you think, act, and feel. You get angry more often. It's hard to concentrate. You worry too much. And you're always on edge. And becoming dependent on prescription benzodiazepines—like Valium, Ativan and Xanax—to treat stress and anxiety is no way to live either. But, you can overcome the effects of everyday stress and anxiety—quickly and naturally. Enjoy the peace of emotional well-being and serenity. With so many of my patients coming to me with stress-related problems, I looked into what ingredients have been clinically proven to combat stress and anxiety naturally. And then I combined the most effective ingredients into my own special formula for fighting the effects of a hectic life. I call it Stress Relief Plus. 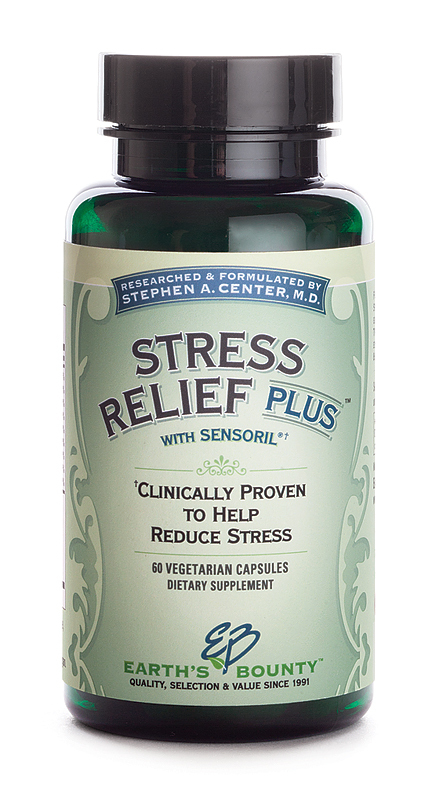 Using the patented ingredient Sensoril®, Stress Relief Plus works to support you body’s ability to deal with fatigue, stress, and tension while giving you the feeling of emotional well-being. In one study Sensoril® dramatically decreased the level of cortisol (the "stress" hormone) in the body and increased the anti-aging, anti-stress hormone DHEA. Sensoril® is a patented form of ashwagandha plant extract that has been clinically shown to support emotional well-being and reduce fatigue. Inositol—Made from plant sources this carbon compound supports the neurotransmitters, serotonin and acetylcholine, to assist in the reduction of depression and panic attacks. L-Theanine—An amino acid that promotes relaxation naturally without sedation. And even though it’s made from green tea, it has no caffeine. Take two capsules of Stress Relief Plus (up to 4 times daily) as needed. This fast-acting formula will work to put you in a positive mood…reduce physical, emotional and mental stress and fatigue…support your body’s own systems for fighting stress. 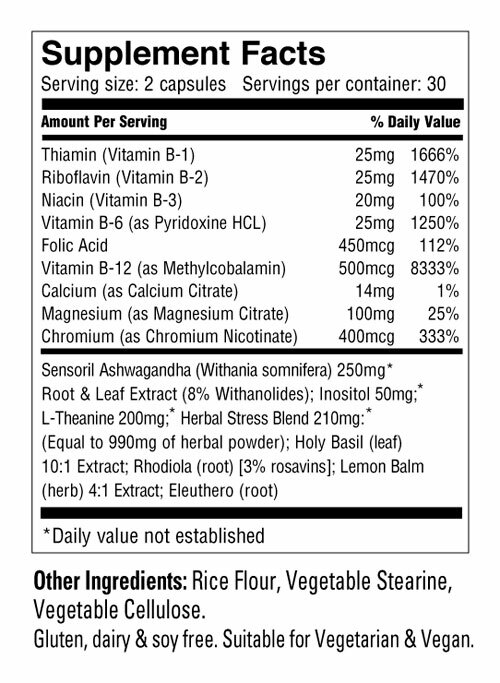 And if stress has kept you awake at night, this all-natural formula is a godsend. Combat the effects of a hectic life and start feeling positive, upbeat and stress free! RISK-FREE! Experience a natural state of relaxation. Soothe your mind. And give your body the physical rest it deserves. Try Stress Relief Plus for the next 30 days. If you’re not convinced it’s working for you, return the unused portion for your money back. It’s that simple. Every Earth's Bounty supplements are made with the finest ingredients, proven formulations and manufactured under the strictest guidelines for purity and potency. 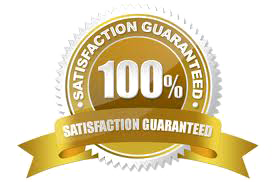 If for any reason you're not 100% satisfied, return the unused portion with a short explanation and proof of purchase, and we'll make it right with an appropriate replacement or refund—your choice! Stress and Anxiety. American Psychological Association Website. Available at: http://okpsych.org/doc uments/DisasterEffects.doc. Accessed on August 5, 2002. Sadock BJ, Sadock VA (2007). Psychological factors affecting physical conditions section of Psychosomatic medicine. In Kaplan and Sadock's Synopsis of Psychiatry, 10th ed., pp. 813-828. Philadelphia: Lippincott Williams and Wilkins. Selective Serotonin Reuptake Inhibitors. American Medical Association Website. Available at: http://arch fami.ama-assn.org/issues/v8n3/ffull/fqa0 599-2.html. Accessed on August 5, 2002. Selective Serotonin Reuptake Inhibitors. Virtual Hospital-Unversity of Iowa Healthcare Website. Available at: http://www.vh.org/Providers/Conferences/ CPS/13.html. Accessed on August 5, 2002. Tricyclic Antidepressants. Medline Plus Medical Encyclopedia Website. Available at: http://www.nlm.nih.gov/medline plus/druginfo/antidepressantstricyclicsyste m202055.html. Accessed on August 5, 2002. MAO Inhibitor. Medline Plus Medical Encyclopedia Website. Available at: http://www.nlm.nih.gov/medlineplus/ druginfo/uspdi/202052.html. Accessed on August 5, 2002. Sensoril® is a trademak of Natreon, Inc. and is protected under U.S. patent #6,153,198 and #6,713,092.